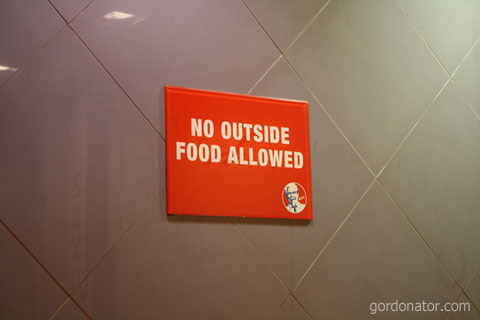 The Colonel only allows inside food inside his restaurant. Can anyone help the Colonel come out with a better sign? Do fast-food restaurants in your region has this rule as well? I believe Noisy little girl can provide some insights about this. She ate Hokkien mee in Mac. LOL! I still miss the good ole days where KFC provides fork and knife. I think M`sia still does that. THESE days the chicken seems to have gotten small! And I mean really small compared to the good ole days. Cut cost? Come to think of it.. haven’t ate KFC for awhile. I didn’t understand the sign, lol’d it should be “Thou shall not eat other foods inside my restaurant except MINE! Damn! Thou shall not ingest victuals which are not prepared by thy chefs. Chickens are not allowed to cross the road here. Not at KFC in Sydney. U can bring McDonalds in and they won’t give a dam. Frankly, through, you can do anything you want, even bring your own chicken to eat there. Just don’t get caught. And if you do, just act blur. lol! its the same rule here and the same wordings have been used. most restaurants wont allow people to bring food from outside and eat, but will make an exception if you order some food from them. I am not sure if this in our area or not…..hmmm never thought to give it a try. The restaurants in my area don’t have the sign, but they generally say “no loitering”, and…when you bring outside food and occupy their space it’s loitering. Actually, this “NO OUTSIDE FOOD” is a very common sign over here. I didn’t even noticed a sign like that in any KFC I’ve been.. Usually its either me or one of my friends who bring in other food like Mac, Burger King or even LJS.. There are some things that ain’t finger licking good. For others, there’s KFC. I don’t see such signs, I must be getting old. thanks for the comments and witty suggestions. interesting to know that some counties practise this rule while some don’t. even more interesting is that some said that certain eateries will let u bring in “outside food” if u buy something from them. lol. your’re welcomed. i’ll drop by your blog often. it’s at funan the IT mall. go check it out if u are in the area. ahem.. i brought the noodles in, ate happily. no one looked. no one really bothered. even though the staff walked past me, they didnt even bat an eyelid. hrm. i guess in some places, they are somewhat more relaxed i guess? not in US here I guess. At least they don’t have that sign. I have seen a group of high schooler brought Donald’s food into the King’s territory, and they were safe; no one asked them to leave or anything. In SouthEast Asia KFC has numerous ‘special’ hot sauces or sambal that you cannot get anywhere else. When i was in singapore space was also a minor problem in some cafeteria areas. most restaurants in the world have this policy but enforcement is lax.